CID is an Indian police procedural television series about Maharashtra and Mumbai's Crime Investigation Department, created by B. P. Singh for Sony Entertainment Television India. The series stars Shivaji Satam as ACP Pradyuman, Aditya Srivastava and Dayanand Shetty as Senior Inspectors Abhijeet and Daya, Dinesh Phadnis as Inspector Fredricks and Narendra Gupta as Dr. Salunkhe. These 5 main characters of the show share a long-lasting bond by working in the series for the same period since its inception on Sony Entertainment Television. The location of the series is set in Mumbai, Maharashtra, India. The series premiered on January 21, 1998 and is the longest running television series in India, no info about the end of the series. The series aired its 500th episode on January 26, 2008; 1,000th episode on September 27, 2013 and 1,500th episode on February 25, 2018. The show also re-runs on Sony's sister channel Sony Pal.On October 27, 2018, the show entered a 3 month break period after its producers and Sony Entertainment Television decided to rejuvenate and reboot the show. The series is an investigative series consisting of criminal cases that are solved by the Crime Investigation Department. ACP Pradyuman (Shivaji Satam), Senior Inspectors Abhijeet and Daya (Aditya Shrivastav and Dayanand Shetty) and Inspector Fredricks (Dinesh Phadnis) are an elite quadro of officers, who pursue criminals through detailed investigation along with their Sub-Inspectors Purvi and Pankaj (Ansha Sayed and Ajay Nagrath) and also seek the help of professional forensic experts Dr. Salunkhe and Dr. Tarika (Narendra Gupta and Shraddha Musale) to solve high-profile cases. CID got into both the Limca Book of Records and the Guinness Book of World Records on November 7, 2004 for its record-breaking single shot episode of 111 minutes (1 hour and 51 minutes), entitled "The Inheritance" without a cut which writer – director – producer B. P. Singh feels "every Indian should be proud of because no one has achieved this before". This special episode was shot between 6:30 – 8:21 PM IST on October 8, 2004 at Lonavala and was aired on November 7, 2004 (Sunday) without a break from 8 – 10 PM IST. Marathi theatre veteran, Shivaji Satam, who plays ACP Pradyuman, had worked with B. P. Singh on many projects before CID. He said in an interview: "Having worked with B. P. Singh on so many projects (initially being the Marathi sitcom Ek Shunya Shunya), I had to be a part of CID". Aditya Shrivastav, who portrays Senior Inspector Abhijeet, was introduced in the show as a criminal but was later added into the CID team. "I had agreed to do only 26 episodes. In 1998, I was also doing some films, and B. P. Singh Sir gave me the flexibility to come and go as I felt like. But I began to enjoy the role of Abhijeet, and so stayed on", said Shrivastav. Singh wanted Srivastav to be part of his team after seeing his work in Ram Gopal Varma’s Satya. Dayanand Shetty, who portrays Senior Inspector Daya was spotted by Sanjay Shetty, a member of the CID production team in a community play in which he was adjudged best actor. Singh was so impressed with Shetty that he finalized him just 5 minutes into the audition. CID is primarily shot in Mumbai, Maharashtra, India. During the long course of the show, the series has been shot in various locations all over India. The series has also been shot in foreign countries. Some Foreign locations have included places like Uzbekistan, a major shoot in Paris, and Switzerland which included tourist attractions like Interlaken as well as cities such as Berne and Zurich. The major shoot in Paris-Switzerland was for the 2 hourly special episode "Aakhri Chunauti", and a part of the production team's 13th anniversary celebration plan. Beginning on July 7, 2006; a nationwide hunt called Operation Talaash was launched, in search of a new officer to join the CID team, which ended on September 1, 2006. Vivek V. Mashru who played Sub-Inspector Vivek, was selected to play the role. Sony Entertainment Television had launched CID: Gallantry Awards, an initiative to encourage and honour acts of bravery in society on January 26, 2010 Republic Day. The second edition of this initiative was aired on January 23, 2011. The third and fourth editions were aired on April 1, 2012 and April 14, 2013 respectively. On July 10, 2015; Sony TV announced the Shaatir Lekhak Contest, in which 3 incomplete stories and clues were presented. Contestants were required to complete any one story out of three. The contest ended on July 26, 2015. The winning story was appeared in episodes and prizes were also given to the winner. From the total entries, 3 winners were selected, one for each story. The result for the winners were declared during one of the episodes of CID prior to September 1, 2015. The series had many crossover episodes with many series. CID had three crossover episodes with the series Aahat, once on November 13, 2009; second time on February 12, 2010 and third time on June 25, 2010. It also had crossover episodes with Adaalat, once on December 3–4, 2010; second time on July 15, 2012 titled CID Viruddh Adaalat and third time on December 20, 2014 titled CID v Adaalat – Karmyudh.It also had a crossover in the famous Sab TV comedy serial Taarak Mehta Ka Ooltah Chashmah for 4 episodes. Titled as "Mahasangram", it started and ended on July 2014. Rediff stated, "Its actors, or at least the core of the cast who have been a part of the series since its inception are so popular they have become household names." Times of India stated, "CID which has constantly entertained its viewers with unique and challenging cases is also known for its different jokes in the world of internet." Rediff gave the series 4.5 / 5 stars, and stated, "Much of the credit for CID's success should go to Singh, and its cast, especially Shivaji Satam who plays ACP Pradyuman". Rahul Hedge of Rediff giving the same ratings stated, "The crime detective series is still going strong". 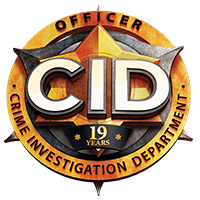 A Bengali adapted version of CID known as C.I.D. Kolkata Bureau airs on SET India's sister channel, Sony Aath. ^ "CID completes 1000 episodes". Times of India. Retrieved 26 September 2013. ^ Uniyal, Parmita (25 May 2016). "Exclusive: Currently off air, CID will be back next month, confirms ACP Pradyuman aka Shivaji Satam". India Today. Retrieved 26 May 2016. ^ Sana Farzeen (23 October 2018). "CID to go on a break for three months". The Indian Express. Retrieved 29 October 2018. ^ "'CID' enters Limca Book of Records". Deccan Herald. Retrieved 3 November 2004. ^ Unnikrishnan, Chaya. "Cops in demand". Indian Express. Retrieved 28 August 2009. ^ "Another hero enters CID – Entertainment – DNA". Daily News and Analysis. 15 September 2006. Retrieved 6 August 2010. ^ "Honour to ordinary". The Indian Express. Retrieved 17 September 2010. ^ "An award night for valiants on TV". The Times of India. Retrieved 14 April 2013. ^ "Chance to give a twist to 'CID' episode". The Indian Express. 9 July 2015. Retrieved 12 July 2015. ^ "CID joins hands with KD Pathak from Adaalat!". The Times of India. Retrieved 3 July 2012. ^ "Sony to screen a telefilm with CID and Adaalat's cast". afaqs!. 19 December 2014. Retrieved 14 July 2016. ^ a b "The TV show with the highest ratings". Rediff. Retrieved 22 April 2015. ^ "Most popular jokes on CID". Times of India. Retrieved 27 July 2010. ^ Rahul Hedge. "Just What Makes CID So Popular?". Rediff. Retrieved 20 March 2012. ^ a b "The Winners of The Indian Telly Awards 2002". Indian Television. ^ "Hero Honda Indian Television Academy Awards 2002". Indian Television Academy. Archived from the original on 29 May 2012. ^ a b "The Indian Television Academy Awards 2009". IndianTelevisionAcademy.com. Archived from the original on 9 September 2015. Retrieved 10 July 2012. ^ "The Hero Honda Indian Television Academy Awards 2005". Indian Television Academy. Archived from the original on 4 May 2012. ^ "Sony TV's CID, now in Bengali". NDTV Movies. Retrieved 31 October 2012. ^ "Bengali 'CID' to hit small screen Nov 12". Yahoo! Movies. Retrieved 31 October 2012. Wikimedia Commons has media related to C.I.D. (Indian TV series). This page was last edited on 22 April 2019, at 06:36 (UTC).